Ron “Jaws” Jaworski, is a famous commentator and color man for the eponymous sports network ESPN, but before most of the recent generation of fans recall, he was a great quarterback story that unfolded in the City of Brotherly Love, – Philadelphia. Well we have to go back even before that to where the tale of ‘the crossroads of quarterbacks’, Ron Jaworski begins. Youngstown State isn’t exactly a household name when it comes to football – and in fact is more well known for the Ward Beecher Planetarium more than anything else. The Penguins though played in a hybrid offense called the side-saddle T formation (where the quarterback stood off center and faces a sideline with two runningbacks and a wingback in motion). Ron played for them from 1969 through 1972 setting multiple records and ranking among the school’s leaders in 11 offensive categories.In his senior season Ron was ranked 5th in the country among college-division passers. He finished his career at Youngstown with 32 TDs, on 325 completions, and 4,612 yards. For a guy who the Rams couldn’t stand because he didn’t fit their scene (4-0 record as a starter), the criticism he took for not being able to get to the big game (4 playoff wins, superbowl appearance), and the belief he’d never make it out of tiny Youngstown State (15 seasons in the NFL), Ron Jaworski is a great story about a kid who decided to chase his dreams so that he wouldn’t have to straighten metal bars in a factory and play a game he loved for the rest of his life. At the time of his retirement, Jaworski held the NFL record for most consecutive starts with 116, (since surpased by Brett Favre, Peyton Manning, and Eli Manning). 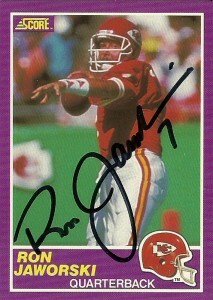 Ron is a popular name in the sport of American Football. He is a fixture at ESPN, spent 5 years on Monday Night Football, has been involved with youth football, expanding the sport for many years investing overseas in a variety of football ventures, and is part owner of the AFL Philadelphia Soul. Jaws has been nominated for the NFL Hall of Fame, and in 1992 was inducted into the Eagles Honor Roll. 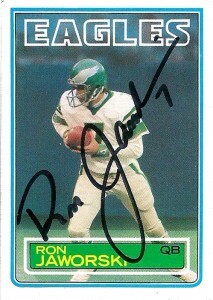 You can visit him at ronjaworski.com.